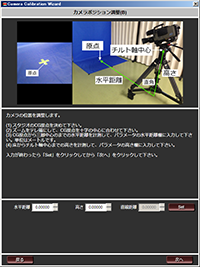 Simple introduction of real-time CG! Real-time CG (RCG) was formerly thought to face high hurdles such as the need to introduce a large-scale system and the operations that include CG creation, but FOR-A’s SmartDirect RCG system completely overturns these assumptions. FOR-A’s SmartDirect RCG system is offered as a turnkey system integrating all elements including a video I/O board (MBP-1244), CG rendering engine, and control software. This means that customers can complete the required hardware introduction simply by mounting a PTZ (Pan, Tilt, Zoom) sensor onto a camera. An option is also available for using Qoncept’s QUU marker-less sensor, which does not require a hardware sensor, in place of the PTZ sensor. The intuitive and simple user interface does not need any special training for operation, which minimizes the lead time from introduction to operation. FOR-A’s SmartDirect RCG system realizes all of these features at an incredibly low cost. For broadcast stations and video production professionals who have been considering the introduction of RCG, the time to act is now! 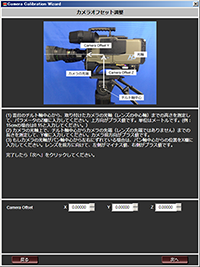 Click to select the RCG items for composition. Click the NEXT button to play (On Air) the selected items. Buttons are registered by dragging and dropping from the Template list window to the Direct button window. The button order is edited by dragging and dropping buttons within the Direct button window. Click the button to be edited in the Direct button window. The link setting is changed by dragging and dropping templates between the Sensor Link OFF list and the Sensor Link ON list. 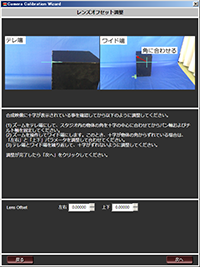 The sensor mounted on the camera can be calibrated by following easy-to-understand instructions provided by a Camera Calibration Wizard.